The RP-603Z released about 1994 and retained the same Minolta EP-50 copier engine the Minolta RP-502, RP-503, RP504 and RP-600Z used, although it introduced a series of zoom lenses, an electronic mage rotation feature, auto image masking and a host of motorized film carriers that were available to the RP605Z. Its market was believed to fit those users that could not justify the top of the line RP-605Z but also had needs the RP-600Z could not meet. It was a successful system and made improvements to the previous models, especially in the fuser system which was more reliable. The RP-603Z was built on a table top chassis, so it was much more compact than the RP-605Z. This same RP-603Z chassis was used for the next series of Microfilm Reader Scanners like the MS-2000, MicroSP 2000 and the eventual superstar of the industry, the Minolta MS-6000 & MS-6000 MKii. The Minolta RP-603Z was also sold as the Bell & Howell ABR-2300 and the ALOS Z-43. The current market status of the RP-603Z is that of a discontinued product with very few replacement parts or supplies available from Minolta or aftermarket sources. 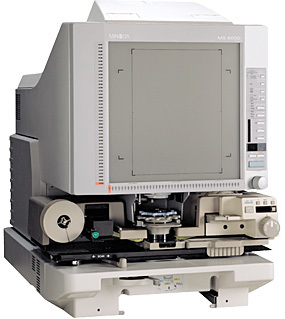 Most users of the Minolta RP-603Z had microfiche, while relatively few had the optional motorized roll film carriers. Newer and more modern Microfilm Reader Scanners like the Micro-Image Capture 7 and 7M make for ideal replacements for the aging Minolta RP line. The Micro-Image Capture 7 comes equipped with a fiche carrier, 7-54x zoom lens, footswitch, software, cables and a 1 year repair or replace warranty for about $3,275. 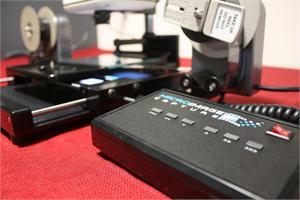 The MIC7 connects to the user’s pc and connects via USB port to stream the microfiche image directly to the PC monitor. View your microfiche in real time and capture images in one second for distribution to a network printer, file folder, email and more. The Micro-Image Capture 7M offers a fully motorized 16/35mm Roll Film Carrier with Fiche handler for a Universal Fiche and Roll Film reader scanner solution under $5,000!